The future life for humanity will prove to be not only more just and less stressful, but infinitely more interesting than it is now for many millions of people. The work of reconstruction is so vast that, in that area alone, the creative powers of many will find endless stimulus. Later, as the preliminary teaching of a more esoteric nature is deemed desirable, the flood-gates will open wide and an extraordinary pent-up thirst for knowledge will manifest around the world. Men will be astonished by what there is to know, and will eagerly act to quench their thirst. An enormous educational programme will provide the required knowledge and understanding. The reality of Initiation as a prime factor in the evolutionary journey will inspire thousands to take in hand their own evolution, and so to undertake the necessary refinement of their vehicles. With some Masters working openly, an extraordinary stimulus will be given to this work and much will be accomplished in a relatively very short time. Nearly five million people already stand at the threshold of the first Initiation. Their number will be increased by many thousands before long. Thus will the Mysteries of the Initiatory process inspire and galvanize humanity to place its steps solidly on the Path to Liberation. Such a view, at this time, might seem far from the reality, even somewhat naïve, but the outward presence of Maitreya and His group of Masters will have an amazing impact on the minds and hearts of literally millions of people in every country. These will now stand ready, their aspiration high and pure, for the creation of a new world, and for an entirely new view of what it means to be alive on planet Earth. Many of them, perhaps the majority, are young and relatively untarnished by the cynicism and unfettered greed of their elders. Thus they see clearly the answers to the problems which confound their fathers, blinded as they are by the faults and glamours of the past. These young people will remake this world for their fathers. They have come into incarnation for this purpose and will answer Maitreya’s Call. They come, too, many of them, trained and prepared for the tasks which await them and which, undaunted, they will gladly perform. Have no fear, the world is safe in these young hands. They await, eagerly, the opportunity to serve and save. Many, today see clearly the faults and weaknesses of men; few, indeed, can see the Divinity which gives Us, your Elder Brothers, the sure knowledge of man’s ultimate triumph. Q. How many interviews has Maitreya had to date? Q. Thank you for your work so far, your insights and information. Over the years I have read a lot of articles about the Space Brothers, how they live in etheric bodies and how the cosmos is filled with civilizations who seem to be far beyond our level of evolution. But are there also, besides Earth, planets on the dense material plane of the cosmos, that have civilizations who are about our level of evolution or below? A. You must be. The star you are seeing is a real star. The ‘stars’ (all four of them) I predicted in December 2008 are really spaceships. Q. A growing number of eye-witnesses and UFO investigators are coming to believe that the large, silent, triangular UFOs being seen around the world are actually top-secret experimental aircraft being flown by one or other government, mainly the US. (1) Is this the case? (2) Is any government currently flying aircraft using propulsion given by the Space Brothers, or “reverse-engineered” from recovered spacecraft? Q. I have seen videos of brilliant star-like objects on YouTube that look exactly like photos of the star-sign published in Share International, only the videos were made in late 2007 and early 2008. Were the Space Brothers “test flying” the star-UFOs in our atmosphere months before you announced their presence in December 2008? If so, were there any difficulties that had to be worked out? A. Yes, many. Even once the ‘stars’ were in place, certain technical difficulties had to be rethought and remedied. It is a huge, ongoing undertaking. Q. You have referred to a top-secret group – mainly in the US –whose sole mission and activity is to denigrate the UFO phenomenon and condition the public to have a negative attitude about the subject. (1) Does this group have – in various major news organizations – “moles” whose task is to debunk or ridicule any major UFO sighting that may be reported? (2) Many UFO themed websites have forums in which readers may comment anonymously on UFO sightings. Does this shadowy group monitor these websites in order to ridicule or debunk sighting reports? Q. Is a so-called ‘World Government’ ever likely to come into existence? A. No. Hierarchy’s plans do not include the formation of a one world government. Rather, the United Nations is seen as the platform for all international problems to be brought forward and talked through. Each nation is seen as having its own destiny and its own rays or energy structure, which bring about that destiny and give quality to the individuality of each. One could say in a phrase, that ‘unity in diversity’ is nearer the vision of Hierarchy. Q. In the short term Maitreya will undoubtedly have to suggest a land-for-peace deal between the Israelis and Palestinians. However, in the long term will the nation of Israel cease to officially exist and become part of Palestine once again with no partition? A. No, I do not think Israel will cease to exist – too much time has passed for that – but the two nations will live side by side, sharing the resources of the area together. Q. Will there be a further economic collapse or is the worst over now? A. No, it has not yet reached its end. It will continue, although there will be slight improvements in some respects, especially in the monetary sense. But from the point of view of work and industry the crisis is of such proportions that it will take years to put to rights countries like the USA and Europe, where thousands of jobs are being lost every week. We can feel what is happening to the developed world, but think what must be happening in the developing countries. What must it be like in Africa for the starving millions? Our ability to make the difference between them living and dying has been put back by a year or more. Suddenly, the developed nations feel poor. We can not afford to help the developing countries, we say. If it’s bad for us, how must it be for people who have been living on the edge – living on a dollar or two a day? That is what we should think about. The next day, I remembered that elderly woman, her feet and the sticks that held her steadily and strongly. I felt deeply that I need to walk my life with each step firmly on the ground no matter how frail the body becomes, or no matter how difficult life presents itself to me. That elderly woman looked very much like the mother of my friend. Was she a special person? On about 25 September 2010, while in Paris with my sister Dorothy and her husband, Tom, he was taking our little elevator from our 6th floor apartment down to the first floor to take out the garbage. Just as we were wondering what was taking Tom so long, we heard him banging and calling for help. He was stuck between floors in the elevator, and was becoming very upset. We had no working phone, and the Otis call alarm in the elevator was not working. Panic was setting in, so I asked Maitreya if he could get Tom out of the elevator. After a short time, the elevator came to our floor, the door opened and Tom walked out. Did Maitreya make it possible for Tom to get out? A few years ago, I had to go through a dental surgical intervention and one infected tooth had to be extracted. In the aftermath of this operation I had to undergo gum curetting interventions every two days over a period of several weeks. It was painful and really hard to bear. He went away after a while and just said: “God bless you!” I smiled and thought about Maitreya and this made me happy. I went to the dentist light-heartedly. Would you be so kind as to let me know if this man was Maitreya? As the number of increasingly spectacular UFO sightings around the world continues to grow (as reported monthly in Share International), so does the number of retired or active government officials and other dignitaries who go on the record with their experiences of other-worldly craft, as well as the number of relatively high-profile happenings that indicate the world’s readiness to hear the truth about the presence of UFOs on our planet. After years of struggling to be given access to government files and have witnesses’ statements recognized or validated, a global ‘exopolitics’ movement is now on the rise. The efforts of Steven Greer’s Disclosure Project, Stephen Bassett’s Paradigm Research Group, as well as many other individuals and organizations, seems to be bearing fruit in a convergence of recent events that indicate the cover is no longer big enough to cover-up the truth. An extraordinary press conference took place at the National Press Club in Washington DC on 27 September 2010, and was reported by mainstream media around the world. Seven former United States Air Force personnel testified to the existence of UFOs and their ability to neutralize nuclear missiles. UFO researcher Robert Hastings, who organized the conference, said: “I believe … this planet is being visited by beings from another world, who, for whatever reason, have taken an interest in the nuclear arms race which began at the end of World War II.” He announced that the seven officers at the conference were among a group of around 120 former military officials who have had similar experiences. For the second time in two months, an airport in China was temporarily closed due to a UFO sighting. The airport in Baotou, Inner Mongolia, was shut down on 11 September 2010 for more than one hour after an unidentified object appeared on the radar of air traffic controllers, and a bright light was seen moving erratically in the sky. Three arriving flights had to circle the airport while waiting to land, until the UFO disappeared. Two other flights were diverted to nearby cities. The object was described as “flat and tubular” and hovered near the airport before suddenly disappearing. In July 2010 the airport in Hangzhou in Eastern China was shut down for one hour when an unidentified object was seen on radar (Share International, September 2010). 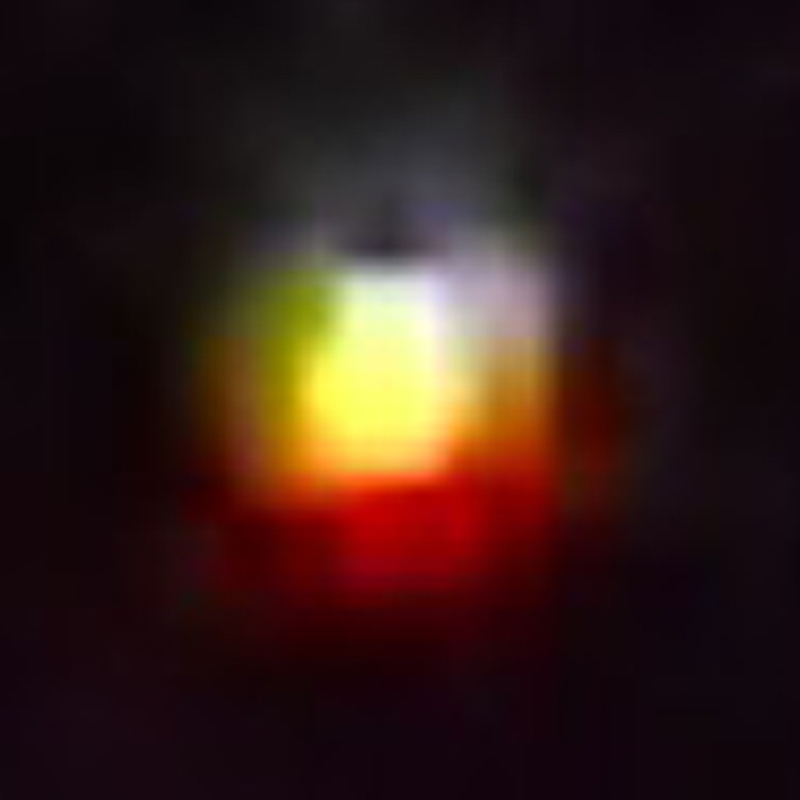 These new photographs are all confirmed by Benjamin Creme’s Master to be the ‘star’ that heralds Maitreya’s emergence. Photograph taken on 18 September 2010 at 10.29pm on the Grand Mesa, about 50 miles east of Grand Junction, Colorado, USA. 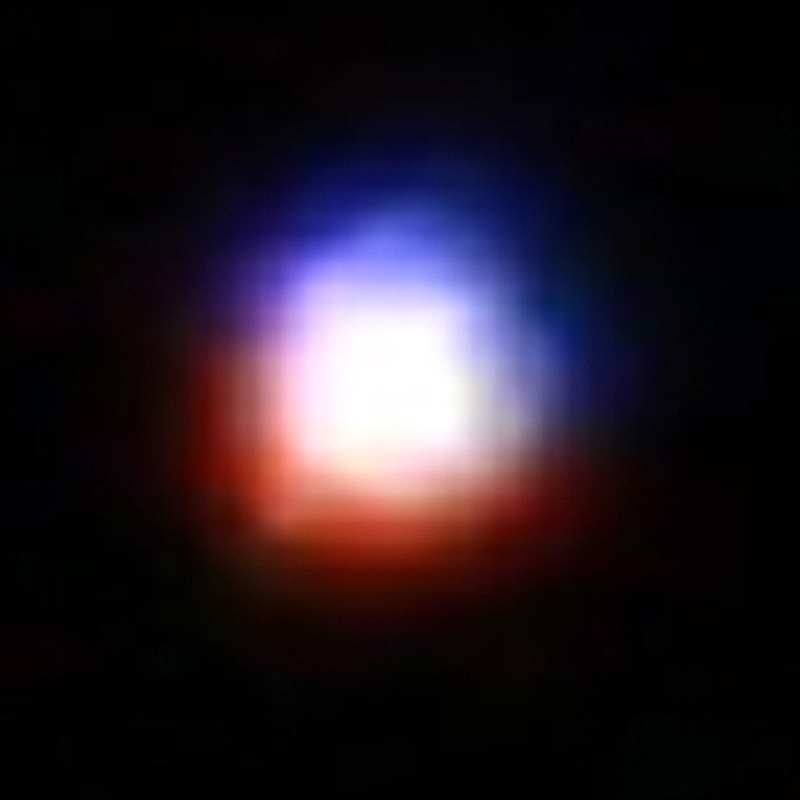 “My husband and I saw a very bright object that was blinking red, green, blue and white. It seemed to remain in its location and moved farther up above the horizon as the night went by. We watched it for at least two hours,” writes D.E. Please find attached photos that I took while on holiday in Italy during the last two weeks in August 2010. I was staying in a small village called Spelonga that over looks Mount Vittori. One night while walking, we noticed a very bright yellow light so we used the full zoom on the camera to take these photos. I am seeing these lights more and more. On 25 September 2010 I saw a bright orange light flying towards my flat, it took a sharp turn to the right and flew away. A few seconds later another one came following the same flight path and just as it was making the right hand turn, the first one flew back to meet it and they flew off together. I know that these lights are some kind of craft because of their brightness and the speed they were flying. 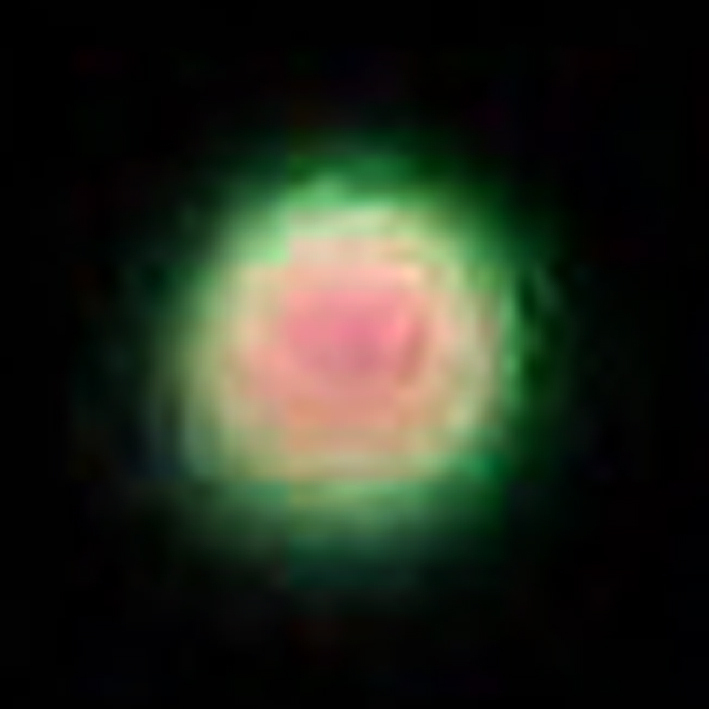 Amsterdam, Holland – Filmed in Amsterdam, from 11pm till dawn on 2 August 2010, the object moved above the houses from east to west. Sent by M.Z., Holland. We present a first selection of quotations on the theme of ‘Simplicity’ from Maitreya (Messages from Maitreya the Christ, and Maitreya’s Teachings – The Laws of Life), Benjamin Creme’s Master (A Master Speaks), and Benjamin Creme’s writings. My plan is to release into the world My simple Teaching of truth: that men are One, brothers all; that God loves all men equally; that nature provides the sustenance for everyone to share; that, coming as I do from mankind’s past, I know the answers to man’s dilemma. I shall show you the simple ways of change, of correctly relating one to another, of correctly manifesting the Will of God. “See your brother as yourself,” says Maitreya. Create an International Storehouse from which all can take. Only thus, by Sharing, can the world be renewed, is His Teaching. Only by Sharing, He will affirm, will men find the happiness they seek. 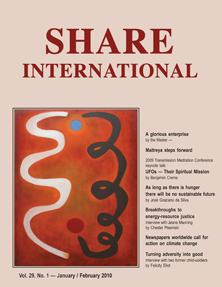 Sharing alone will bring Justice and Peace. Maitreya is adept in making the profound clear. That is why He is a World Teacher. When you see Him you will find a teacher whose simplicity appeals to humanity. Maitreya can make the profoundest statement of truth in the simplest possible way, which touches the heart and understanding, and therefore the intuition, of quite average people….